The Continuing Dental Education Department recognizes its responsibility to provide the dental professional with high-quality CDE covering the most current information available on a wide variety of topics, from new techniques and materials to innovative practice management solutions. Short courses, one to six days in length, are offered for this purpose throughout the year. 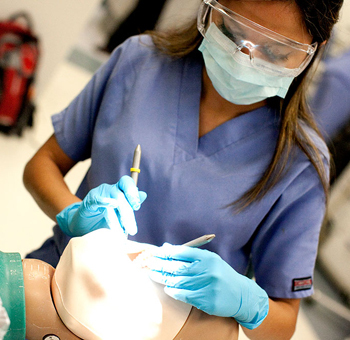 These courses are presented at the College of Dentistry in Gainesville, at the University of Florida Partnership Center located at the St. Petersburg College Seminole Campus, and at different locations within the state, or in some cases, at resort destinations or on cruises. In addition, the Continuing Dental Education Department proudly offers the only two-year Comprehensive Dentistry Program that engages participants in intense instruction designed to assist dentists in meeting the requirements of the AGD Mastership Certification.